The largest maker of Palm OS devices, Sony has left the world market. Many users switch to the rival platform. Virtually palmOne turns to be the only maker of Palm OS devices. The inter-platform competition comes to naught. There wasn't introduced a device powered by Palm OS Cobalt 6. The public has been waiting for the release of devices based on the new operating system for more than a year, however still in vain. 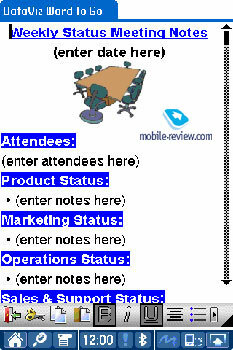 Besides in the end of the year palmOne said, probably there would be no such devices till 2006 in the market. The 3Q 2004 for Palm OS platform is one of the worst in company's history. For the first time Pocket PC platform outpaces Palm OS with the devices sold, the result of 2004 marked the loss of the leadership for Palm OS. Is it everything that bad and Palm OS is going down? What will happen to the platform? PalmOne and Palm Source seem to care little about the lost leadership in the market and technological gap. Palm OS can last for a year or a year and a half on the old operating system, high popularity in the masses (especially in the US) and popular trademark. palmOne announces the most favorable 2Q of the financial year. The sales made up $376.2 million, the net profit - $24.7 million (a tenfold rise compared with the same period the year before). PalmSource also announces favorable 2Q of the financial year. The sales volume amounted to $19.2 million and the net profit - $2.1 million (in the same period the year before the company had $9.1 million losses). 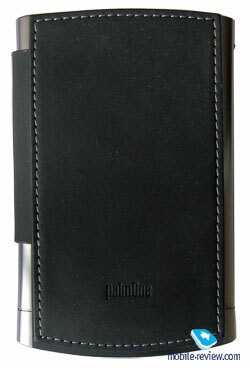 palmOne reports on record sales of Palm Tungsten E (each 5th PDA sold in the US) and the Palm Zire series. Treo communicators enjoyed high sales (in the US), but that's another story. Well, the lion's share of Palm OS devices falls on the US market, the demand here is inertial, and we come across a traditional devotion to Palm. However palmOne realizes this situation can't last for long, sooner or later if the company doesn't take reasonable steps and proceeds with old technologies only, the US market will be switched to Microsoft platform. 2005 will be the crucial year for Palm: the platform will either lose its leadership for some long time (I don't feel like writing - forever, but this can happen) or will try to restore it, or at least not to remain far behind. Let's try to view possible scenarios for 2005. Palm OS Cobalt devices are postponed till 2006. There appear updated models in the current line, let them be called Palm Zire 32, Palm Zire 73, Tungsten E2. The Tungsten T series is followed by models slightly differing from T5, Wi-Fi support added (the main distinction). Other handhelds also differ slightly (a bit larger memory size, better screen in junior models, new processors, 2-megapixel cameras). 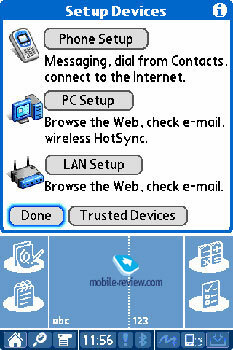 The Palm Treo series still runs Palm OS. Companies report more frequently on financial successes: no substantial investments into R&D, debugged quality control at the production of devices on the old platform (lower costs of warranty services), wide margin between the cost and retail prices (it's possible when there are no inter-platform competitors at all). The developer of the software platform part, PalmSource won't succeed in finding strong partners to replace Sony in a way. The existing partners (Samsung, the Chinese giant Lenovo) do not figure on Palm OS seriously, they hold the patent to be on the safe side. Result: greater market share loss, especially in Europe. 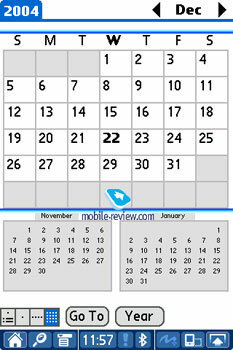 Some users of Palm OS devices can't wait any longer and switch to Windows Mobile devices. There are other adverse factors for Palm OS devices: the future release of Windows Mobile 2005 (the code name - Mantego), price cuts on top Pocket PC devices followed by the tough competition, restricted model line of Palm OS devices. The model based on Palm OS Cobalt will be available in the first half of 2005, it will combine the VGA-screen, dual integrated wireless adapters Wi-Fi and Bluetooth. The software compatibility matters with new OS are settled down quickly with the release of the software specially designed for new OS. The rest of the line is also updated with devices based on Cobalt. The Palm Treo series is shifted to Windows Mobile using a development solution by the Taiwanese company HTC. PalmSource finds the alternative to Sony, which is no longer on the world market. Result: the platform goes on competing with Windows Mobile. The technical gap is eliminated in users' eyes. Although the platform won't be leading till the end of 2005 because of its restricted model line. Naturally, we pictured the extremes, the reality will be somewhere in between. The plans of palmOne are closer to the positive scenario, but they depend much on the readiness of Palm OS 6 device and on the results of the 3d financial quarter 2005. The fact that PalmSource announced the course to Linux platform shows that the developers realized they were unable to develop new OS versions on term (there is no other explanation to this long suspension of devices based on Palm OS Cobalt). I'd say one more time, 2005 will be the crucial year for Palm. 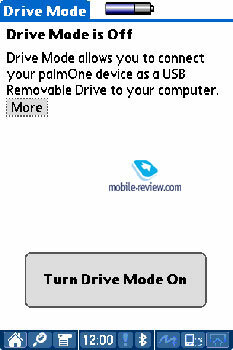 The current product line of palmOne is divided into 3 groups. The first group includes Zire products, which are low-end solutions equipped with organizer and multimedia functions. The sub-brand Tungsten deals with "serious" and advanced PDAs designed for business users. And the Treo represents smartphones. 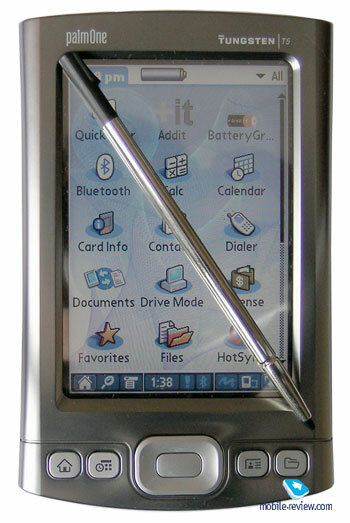 Right after the announcement Palm Tungsten T5 roused the tide of negative critics among reporters and ordinary users. Before the release it had been rumored that the model would be powered by Palm OS 6 and have dual wireless adapters, VGA screen and QWERTY-keyboard. Imagine how the public was surprised to see an inferior version of the Tungsten T3 instead of the technological flagman model. The device lacked a slider keyboard (a distinguishing feature of Palm Tungsten series), a voice recorder and LED indicators on the shell. The positive change touched upon an extended battery. As a matter of course there were no Wi-Fi modules or VGA screen. But still, let's have another look at the situation. 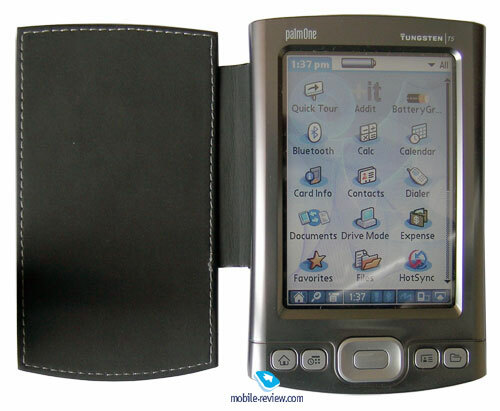 PalmOne just had no time to prepare the real Palm Tungsten T5 based on Cobalt. Besides it was the high time for the company to announce the top model of the line. As a result the company decided to reequip Palm Tungsten E2 into Palm Tungsten T5 quickly and add a unique function (built-in USB flash drive). In our review we'll try to minimize the comparison with the Tungsten T3, for Palm Tungsten T5 is not the real TT5, but the renamed Tungsten E2 meant to close the gap in the model line by palmOne. The unique feature of the T5 (according to company's marketing specialists it should draw attention to the handheld) is the capability to work as a USB-flash drive without any extra software, like in case with common USB-flash trinkets, which became very popular. Let's try to find out whether it is that unique and necessary. The available Flash memory makes up 161 MB, you can store anything on it and then work with the files on the handheld or just use it to transfer files. If the handheld has a SD or MMC card inserted, the card becomes accessible as a flash disk. Besides the largest memory size for the SD card has already reached 2 GB, and the price for the 1GB SD card has dropped to $90, the 128 MB SD card - $15 or less. There is nothing to comment on here, everything's clear enough. I'd only note that the lag of the integrated flash is due in most part to restrictions of USB 1.1 standard. The real price for this peculiarity of the T5 is about $35 (a card + a reader make less price difference than that between the T3 and the T5), low speeds, no need to take the reader with you. 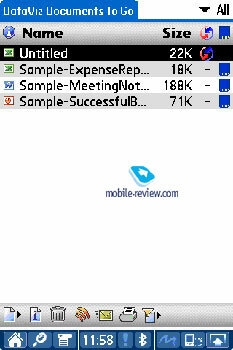 In result, we have a nice feature, but it can be the decisive factor when you buy a PDA, just another plus. I was a little bit surprised when I saw no cradle in the standard kit, after all it was supplied with the Tungsten T3. However, if we remember the Tungsten E without a cradle in the kit, the matter becomes clear. Instead of the cradle there is a USB-cable with the HotSync button. The protective flip cover is mounted on the left. I liked it - it coped well with its functions, it protects the screen from being damaged. It looks expensive and feels pleasant to touch. There is a major flaw with it - when placed in the pocket, it turns to press buttons and the joystick, the T5 needs badly Hold button, an essential element in Sony handhelds. Design of the Tungsten T5 is inherited from the Tungsten E, the resemblance is obvious. The Graffiti zone is replaced by the virtual analog, the casing got darker. As for weight and dimensions, they are average, considerably larger than in the T3 with the slider shut and thinner than a dual slot Pocket PC. The shell is made of plastic, which feels metallic. In all, the handheld feels comfortable in hand. The application buttons and the joystick under the screen prove to be comfortable while handling documents and games. In all, they have no flaws; they are well positioned and have optimal size. I found them fully identical with the analogs in the Tungsten E. As in case with the Tungsten E there are no LED indicators above the screen, besides other control elements are located at sides. There is nothing on the left and the right sides, a voice recorder button could have gone here. At the back panel we find a loudspeaker and a reset pin hole (unscrew the stylus to tip it). The bottom hides the Multi-Connector and nothing special. The screen in Tungsten T3 has a 320x480 (HVGA) resolution, in the middle between QVGA and VGA screens for Pocket PC (picture quality and screen size). It is comparable with that of T3 - the same size, good color rendering, performance under the sunlight, excellent viewing angles. This is one of the best among Palm devices, however it yields greatly to top Pocket PC models with VGA screens. There are 53 MB of RAM available onboard; this is more than enough for Palm OS. The heart of the handheld is its new Intel XScale PXA270 processor working at 416 MHz. Subjectively it is at the same level with the T3, everything runs as quick, you'll hardly notice a difference. The synthetic tests revealed some peculiarities, i.e. some strange graphic test results (long time in drawing dots with LCD Analyzer along with high graphic test results in pBench). The developers might have tried to optimize the operating system to Wireless MMX technology, which is built in the new Intel processor. The only reprimand to the speed arises during the reset, which lasts for some dozens of seconds. The PDA comes with the non-removable battery capacious of 1300 mAh, that's much higher than 900 mAh in Tungsten T3. The battery life has increased correspondingly. Under the maximum load (video playback, the highest backlight level) the T5 worked for some 3 hours till the first alert of battery low level. In the MP3 mode with the screen off (the playback in pTunes from the memory card, system alerts ignored) the battery got drained out after 11 hours. We can compare the work of Bluetooth in Tungsten 5 with Palm Zire 72, the opportunities are identical. 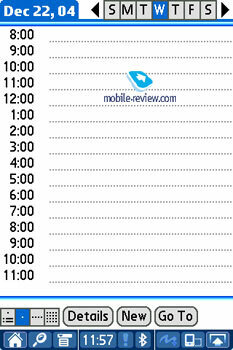 That is the handheld featuring best Bluetooth opportunities among all Palm OS devices, but still lags behind Pocket PC. 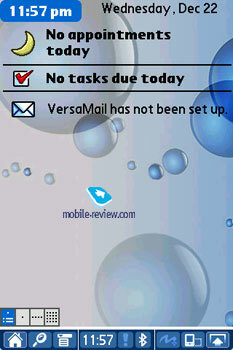 At the bottom of the screen you see the status bar with icons, which facilitate the work with the PDA. 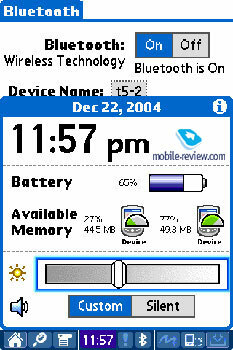 From left to right: House -resumes the list of applications, tap it to see the list of frequently used applications; Magnifier - ordinary search engine; Menu - launches menu in any application; Clock - displays current time, tap it to see the battery power left, available memory, the level of backlight and sound (the photo below); Bluetooth icon stands for Bluetooth activity; Exclamation mark - a prompt in different applications. As a matter of fact there aren't serious changes in the software compared with Palm Tungsten T3, so we won't go into details here. The built-in personal information manager (PIM), the same as in the T3. DataViz Document To Go. A powerful package to edit original MS Office documents without the preliminary conversion. Files. 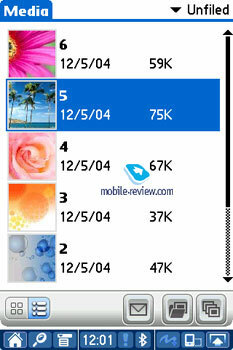 An integrated file manager. In Russia the device is available for sale with the russificator by Paragon (Russian interface, text input in the Russian, Russian fonts, partial compatibility with Russian MS Office documents). If we treat Palm Tungsten T5 as the successor of Palm Tungsten T3, then I'd say it failed. There is nothing fundamentally new about it, some functions and the kit are cut. The unique integrated flash-drive adds to the functionality, but this is hardly a big reason to buy T5. You can replace your T3 with T5, if you do not care much about the money spent on it and you are not satisfied with the battery life of T3. As a matter of fact Tungsten T5 is a successor of Tungsten E2; you can see it even with the naked eye. The latter costs $200, while T5 is twice as more expensive. For that price difference the user gets Bluetooth, HVGA screen, and built-in flash-drive. That's all. However, the price for Palm Tungsten T5 can be considered too high, as I have already said, the model has no direct rivals, that means it will be sold. But we still expect to see the real successor of Tungsten T3 based on Palm OS Cobalt in 2005.